Danica Roem, democratic candidate for Virginia state legislature, canvasses through a neighborhood in Manassas, Va., last month. Roem speaks with her campaign manager Ethan Damon after speaking at the democratic party meeting in Manassas. Roem argues she's uniquely informed about local issues and prepared to problem-solve because of her years working as a newspaper reporter in the region. "Why is that ever okay for an elected delegate to be talking about their constituent's surgical history on the radio?" Roem asked. "That's messed up." 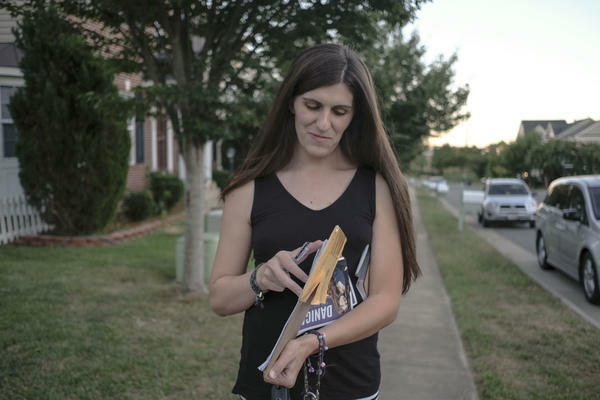 State legislative races don't usually draw a lot of national attention – but Virginia's House District 13 race is: it pits a Republican incumbent known for unsuccessfully sponsoring a so-called "bathroom bill" against a transgender woman. If she succeeds in unseating Delegate Bob Marshall, Democrat Danica Roem would be the country's first openly transgender state lawmaker. Roem's background may set her apart as a political candidate, but her message to voters in this district, in the outer Washington, D.C. suburbs, is pretty standard for a local politician. She's focusing on bread-and-butter "quality of life" issues, she says, like roads funding, schools, and water infrastructure. "I've dedicated my professional career to vetting information...and then reporting the truth as it is, not what other people hope it should be," she said. "...And when I'm in office I can do the same thing." But most of the attention has focused on Roem's status as a transgender woman challenging an incumbent who known for his opposition to LGBT rights. Marshall has been in office for 26 years – since Roem, now 33, was a child growing up in the area. Marshall hasn't responded to repeated requests for interviews with NPR, but he has talked to conservative radio hosts like Sandy Rios of American Family Radio. In an interview in September, Marshall said the race is about more than local policy debates. "Danica clearly is out here doing this for making a marker in the national character that you can engage in this behavior - which clearly goes against the laws of nature and nature's God - and hold public office to make decisions on behalf of the common good," Marshall said. "That is what is kind of at stake here." In that interview, Rios and Marshall also speculated about whether or not Roem has had surgery as part of her transition from male to female. In an interview at her campaign office in Manassas, Roem called the discussion "gross," and said Marshall should focus on substantive issues, not her gender. Roem herself doesn't shy away from talking about her gender identity. She has said she wants to be a role model for LGBT youth. And she's responded to Marshall with an online ad showing her taking hormone replacement therapy medication. Don Shaw, a local Prince William County Democratic Committee leader who ran unsuccessfully against Marshall in 2015, recruited Roem to run. 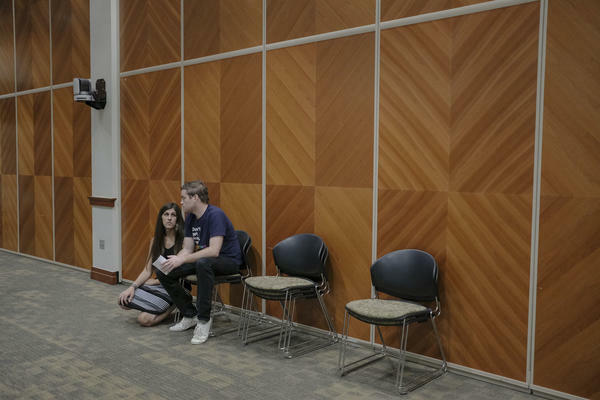 "I would say that I didn't recruit her because she is a transgender woman," Shaw said. "I recruited her because of her credentials." Shaw said he thinks voters in the northern Virginia district are ready for a change after so many years of representation by Marshall, whose hardline conservative politics, Shaw says, are out of step with the region's changing demographics. President Donald Trump drew just 40 percent of the vote in the district last year compared to Hillary Clinton's 54 percent. Meanwhile, Marshall has pointed out that Roem's transgender identity has helped her raise hundreds of thousands of dollars from pro-LGBT donors. Carah Ong Whaley, a lecturer in the politics department at the University of Virginia, said Roem's gender identity is an important part of her pitch. "While she has said that she's not running on that issue, it is very clearly part of her campaign," Ong Whaley said. "She's talking about it a lot on Twitter; she's talking about it a lot in interviews." Ong Whaley said that may be a good strategy for mobilizing Democrats, but it could be a tougher sell to the broader electorate. That's especially true in off-year elections, which tend to turn out more conservative voters. If Roem succeeds, it will be a victory for LGBT-rights activists around the country who've supported her campaign. Aisha Moodie-Mills, president and CEO of the Victory Fund, said such a victory would "send a powerful message" nationwide about acceptance of transgender people.